This page will continue to be updated since there are many foam wing variations worth covering. Some of the variations are the standard sheeted foam wing, the vacuum bagged foam wing, built up wing with vacuum bagged leading edge etc. 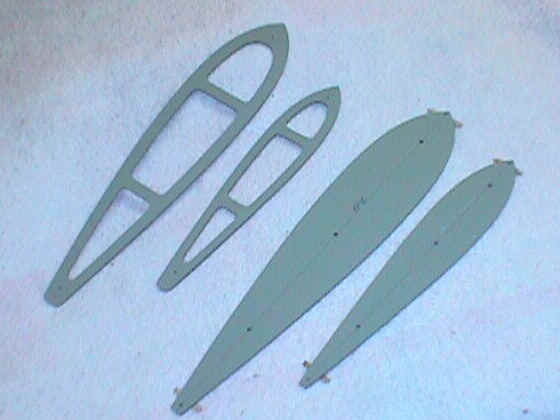 Most modelers think of a foam wing as outdated due to the weight. With the many composite materials and processes available the options become unlimited. There is a learning curve that is inherent in the composite fabrication that is very steep. These pages will help to shorten this curve. Wood Selection Since the wood quantity is rather large in a foam wing it is important to select good light wood. Five pound wood seems to be the norm. The lighter four pound wood is very rare. I have purchased thousands of 1/16 wing sheeting sheets and only had twenty or so true four pound pieces. For a sheet of wood to be an average of four pounds per cubic foot there has to be some wood in the sheet that is less than four pounds. When wood becomes less than four pounds per cubic foot it is almost without structure. Another way around the weight of the sheeting is to use thinner wood. Riley Wooten of Lone Star Balsa will custom plane sheeting to your specifications if you buy in quantity. If using the vacuum bagging technique then carbon veil can be placed under the sheeting with great results. I have always sheeted my foam wings with the grain running parallel to the leading edge which helps the wood make the bend around the leading edge easier. 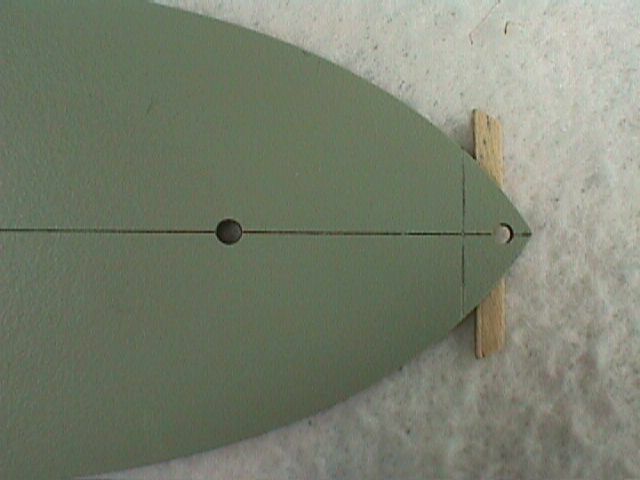 The A grain wood at the leading edge and the C grain wood at the trailing edge. A grain wood is easy to roll or bend parallel to the grain and is the type to use when molding parts from sheet stock and a foam wing is a molding of sorts. The C grain tends to resist the bending forces parallel to the grain and is suited for the straight flat trailing edge. It is also a good idea to apply the sheeting over the pre sanded leading edge and trailing edge. The wing becomes stronger when the sheeting is applied over the leading and trailing edges. Place masking tape on the foam and precede to razor plane and sand the LE and TE down removing the tape only when final sanding. Use a sanding block that is at least as long as the part you are sanding. Edge Gluing Now here is the part that takes some finesse. The hardest part is getting the wood to but together without any gaps. If you have a joiner at your disposal it makes the job effortless. I made a fixture to hold multiple sheets side by side and run them over a joiner to true the edges up. If you are without a joiner then the old straight edge and and sanding bar will work fine. The bar has to be as long as the wood sheet you are sanding. I have found that even though the wood has been trimmed with an X-acto it still needs to be sanded. I believe that the X-acto tends to wander with the grain slightly. Hang the wood over your workbench about 1/16 of an inch and sandwich with another straight edge to keep it flat and lightly sand. Once the edges come together without any gaps I use masking tape to hold the sheets together. Hang one piece of wood over the edge of the bench letting the masking tape to act like a hinge. Apply a bead of medium CA glue to the edge of the sheet. Just enough glue to cover the edge no more and no less. This takes some practice to get right but when you get it right you will be rewarded with very little sanding. Once the glue bead is applied I flip the sheeting on the table flat and rub the seam with a paper towel until the CA has cured. I continue gluing the sheets together until have a large sheet. By gluing the sheets one at a time to the sheet that is becoming larger you are able to trim the large sheet if it is becoming distorted. Distortion usually occurs when you have to pinch them together to close any gaps. Enough sheets are glued together to make one sheet and when cut diagonally makes up two pieces for one wing half. Sanding The Sheeting I have had greet luck with building over glass. Glass is always easy to clean and can be shimmed flat within a few thousands of an inch with newspaper. If the glass is placed onto a metal desk it will hold tolerances that are hard to hold when using a wood or any other surface that will absorb moisture. This flat surface becomes mandatory when sheeting wings or sanding the sheeting or for building an airplane for that matter. The sanding pad that I use is 1/4 aluminum about 4 inches by ten inches with 100 grit paper. The 100 grit sounds a little coarse but with this much surface area on the sanding pad it is required. Place the sheeting on the glass and sand with the grain or diagonally to it. If the glue is applied properly you will not have to sand the seams very much. Most of the sanding will have to be done to get the sheet thickness mismatch evened out. Sand both sides until you are satisfied with the results. Hold the sheet up to the light and candle to see if the seams are sanded properly. Not All Foams Are Created Equal Most foam wings are constructed from Expanded Bead Polystyrene or Styrofoam as most of us know it. The foam is manufactured in large billets ranging from four foot by eight foot blocks to four foot by sixteen foot blocks. These blocks or billets are around three feet thick. The billets are then placed onto a conveyer and cut into sheets with multiple hot wires. As with any other material there are many varieties by many manufacturers. I have purchased foam that was one pound per cubic foot but varied in texture somewhat since it was from a different manufacturer. Most modelers are aware that the one pound foam is the way to go but fail to realize the difference in quality of foam. The lumber yards are a source of foam but of very low quality. The problem with the lumber yard or building supply variety is the amount of regrind material. Regrind material is a recycled foam material that is mixed into the virgin bead material for a filler. When the regrind is mixed into the new material it becomes hard. These hard recycled beads do not cut as smooth as the virgin bead material and create unsightly gouges or lines in the core. Some of the lines can be sanded out but I have had the wire come to a standstill trying to melt through one of these hard regrind spots. Contaminants such as wood chips can also find their way into the foam occasionally. Therefore it is wise to go to a foam manufacturer and specify one pound per cubic foot virgin bead expanded bead polystyrene. Since the cost in transporting one pound foam is high there are many manufacturers locally if you look in the Yellow Pages. The cost is prohibitive in shipping this material so try to locate it locally. Epoxy Vacuum Bagging Wood To Foam Here is where the process begins to show some promise for the competitive aerobatic airplane. The vacuum pump opens up a whole new set of possibilities. It makes the heavy contact cement system obsolete along with setting cinder blocks and sand bags on the wing and cradle. Not only is there a weight savings in glue but you gat 100 percent adhesion. When you vacuum bag the sheeting to the foam you can use less epoxy than with the stack and weight method. I believe that this is due to the vacuum pulling the glue out of the grain and the amount of pressure applied from the vacuum. It is important to obtain a vacuum pump that you can regulate such as the one Aerospace Composites sells. The vacuum can be no greater than eight inches of mercury. If the vacuum exceeds this amount it will crush the one pound per cubic foot foam. Also of importance is not to core the wing out until after the sheeting has been applied. Since the wood is already bonded to the foam at this point more foam can be removed from the wing. I will cover a process in the future where almost all of the foam is removed from the wing. When applying the glue on the wood use a low viscosity epoxy such as Hobby Poxy Smooth And Easy. Scrape the glue thin enough so that the glue is only in the grain of the wood. The surface of the wood should have a damp look without being shiny. If using carbon veil under the sheeting, thinner sheeting can be used. Experiment with sample pieces to see how much epoxy it will take to soak through the veil and bond to the foam. I ran some experiments on this and had good luck with just putting the epoxy on the wood and letting the glue wick through the veil and bond to the foam under vacuum. Pattern R/C wings were sheeted with the veil located where the ailerons were cut out. This increased the trailing edge rigidity and stiffened the ailerons. Carbon Fiber tow could be placed under the sheeting to act as a spar also. Other variations to this theme are sheeting the leading edge of the wing back to the high point and placing strip ribs in the foam and removing the foam after completion. Coring The Foam Wing When using the vacuum bagging technique coring will have to be done after the bagging is complete. Other wise the core will crush. I tried to bag a wing that was already cored under low vacuum and you wouldn't believe how fast I removed the quick connect fitting after watching the wing almost collapse. This was only a test but one didn't need to repeat. When coring a wing it is necessary to make a separate set of templates. The templates become too flimsy if they are designed to do both cutting and coring operations. Here again I found it beneficial to suspend the wing and let the wing rotate around the hot wire. The Hybrid Foam/Balsa/Carbon/Built-up Wing The idea behind this wing is to vacuum bag the leading edge sheeting over the pre-placed full span spar capped with carbon and place ribs behind the leading edge sheeting. The leading edge sheeting extends to the high point of the wing. The ribs are of the I beam variety and are placed into grooves cut into the foam and sanded flush with the surface of the foam. 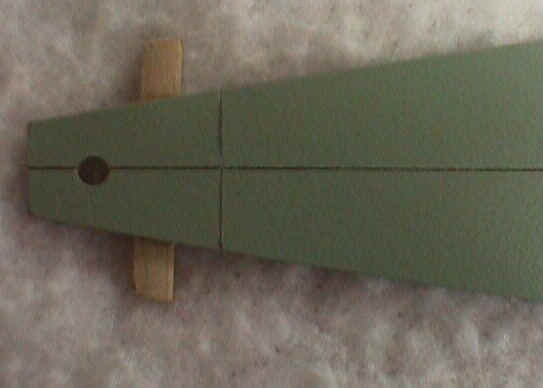 The trailing edge is then glued to the ribs and the trailing edge sheeting and cap-strips are then added. After the LE sheeting has been bagged down to the foam then the leading edge is completely cored down to the wood. The remaining foam left between the ribs is removed. Basically the foam is used as a fixture to hold all of the ribs and sheeting in place then removed. It is a hard process to present without pictures so there will be more pictures and info on this process in the future. This picture shows a wing with a spar installed ready for the leading edge sheeting to be vacuum bagged down over the leading edge to the spar. Balsa strip ribs will be laid into grooves behind the sheeted leading edge. 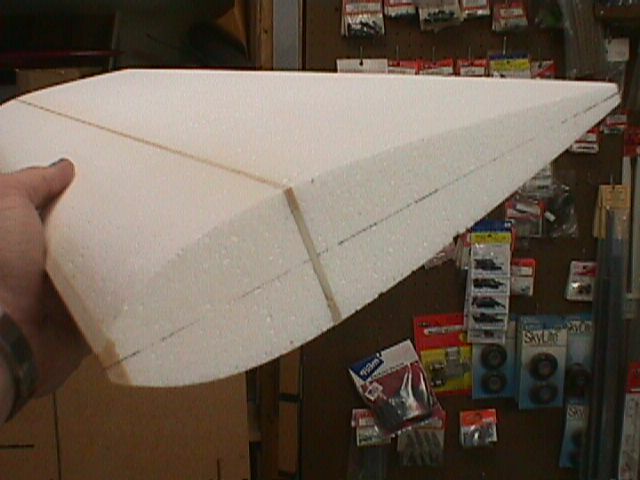 Notice that the leading edge is already tack glued to the foam. It is not necessary to glue the leading edge completely to the foam since the foam will be removed after the bagging process. The spar is a built up balsa warren truss configuration. Template Material The best template material for cutting foam is a product referred to as Formica. It is used in counter top applications and can be purchased in sheets at your local building supply store. Another good source of this material is a kitchen cabinet makers shop. They usually throw the scrap away and will gladly give you their scraps. I try to get the thicker material which seems to be flatter. There is a thin variety but it seems to curl too easily. Solid light colors seem to work the best since you will be able to see the centerline on the material. The type of cutter you are using will dictate the design of the template. Templates that cut only one side of a wing at a time will vary from one that is designed to cut the top and bottom simultaneously . This picture shows the leading edge of a template. The center lines have been scribed into the template for reference. The wood strip on the front is a stop for the foam cutter I designed. The hoes are drilled into the template for large modeling pins to secure the template to the foam block. 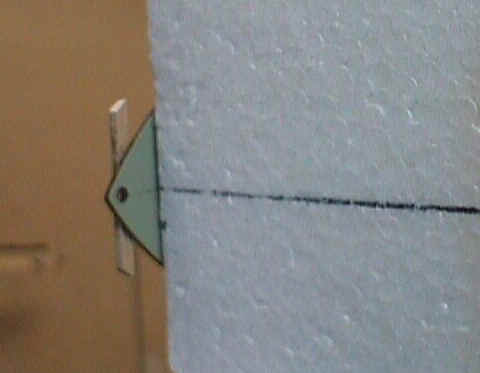 Template that has been attached to the center line running the circumference of the foam block. 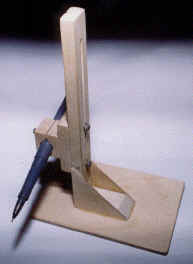 The simple adjustable height gauge that is used to scribe center lines around the foam block. The trailing edge of a template. The hole is where the cable hooks to when pulling the template and block through the cutting wires. The wood cross piece is a stop.